100% pure organic Tamanu oil. The Tamanu tree is indigenous to tropical South East Asia, and produces a yellow skinned fruit containing a large nut. The kernel from within this nut produces a dark, thick oil. 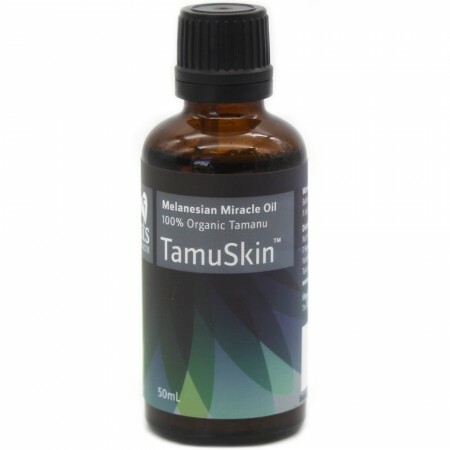 Tamanu oil is a South Pacific skin treatment which can be used on many different skin conditions. 50ml. 100% pure and organic. Safe for you and the environment. Tamanu oil has been used for centuries, and has been proven to have anti-inflammatory, anti-bacterial, antioxidant and anti-ageing effects. Tamanu oil contains high concentrations of lipids, neutral lipids, glycolipids, and phospholipids. Promotes tissue formation, helping to reduce the appearance of scars. Apply on your skin at least three times a day, and up to 10 times on problem areas. 50ml. 100% organic Tamanu oil from Vanuatu.